Enjoy a 2 hour luxury yacht cruise and a 2 course lunch or Dinner. Sit back and enjoy the cruise followed by a relaxed meal at a restaurant on the marina right on the water. Meet your skipper 15 minutes prior to departure time for your safety briefing. Your skipper will give you a tour of the yacht ensuring that you are familiar with all onboard facilities. 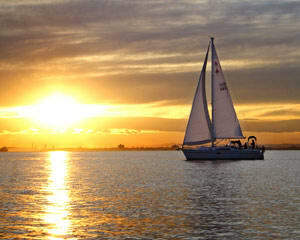 Then you set off on your 2-hour luxury yacht cruise of Docklands out to Port Phillip Bay. After docking it's a short stroll to the Marina-side restaurant for your 2-course lunch or dinner. The perfect end to the perfect day! Lunch cruises depart at 11:30 AM and dinner cruises at 3:15 PM. Minimum 4 guests required for a cruise to proceed. A minimum of 4 guests required for the cruise to proceed. 48 hours to up to 2 weeks prior to the experience date: $50 per person participant fee to change the experience date and time. We thought the yacht cruise was excellent however we were a little disappointed with dinner afterwards. The staff at the restaurant were very pleasant - we couldn't fault the service we received - however we didn't feel that the choice of food or venue lived up to the description of a "luxury" dinner - it was fairly ordinary. That aside, we had a lovely afternoon and our yacht captain was excellent. The only thing I would say as it takes so long to get out of the docks and into the open water, there is not much time spent actually sailing. The only thing I thought was missing was in the original description of the experience it never mentioned you would require 4 people for it to go ahead. This was only mentioned when the experience was purchased. I bought the Yacht and dining experience for my husband and I have to say that he thought it was the best gift he ever received. Now he's talking about buying a boat!! I purchased a Melbourne Yacht and Dinner cruise for my parents and they absolutely loved it. The cruise was safe, fun, and the Captain was very friendly. The post cruise dinner was also a fantastic way to end the day. Quite spectacular seeing the docklands area by day and then by night with all the lights. Also dinner was very enjoyable and would recommend Bistro Vite again.